Once again, its time for TWD! I've found that its the perfect solution to Monday blues since every Monday night (if I've procrastinated, which is usually the case), I have a Dorie baking session to look forward to! 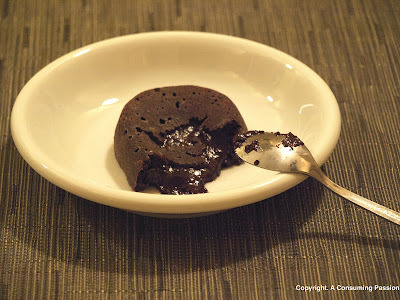 This week, the chosen recipe was Dorie's Gooey Chocolate Cake aka molten chocolate cake or chocolate fondant. While I've made this type of cake many times, I've actually never tried Dorie's recipe so I was definitely looking forward to giving it a go. Molten chocolate cake is one of those cakes that is almost universally loved - you can find it on just about every restaurant's dessert menu - but is so quick and easy to whip up. After having read the problems and questions post on the TWD blog, I decided to reduce the cooking time in order to ensure that I had a gooey inside. As such, instead of 13 minutes, I decided to bake mine for 11. I must have an oven that runs cold though because I think I could have easily left it in for at least another minute. No matter though - the cake was still absolutely delicious, if a little more gooey than normal! Next time you have unexpected dinner guests, this is your go to recipe because you can have it on the table in under 30 minutes tops. Wowsa, those sure were gooey! Mine were not that gooey at all. Maybe next time I can cut the cooking time, but I loved them as they were, so I'm not sure. Wow, those look molten alright! Nice work, they look amazing! those are so gooey! i should have thought ahead like you did....mine were more like sludge than goo! Looks great! I love all that chocolate lava!! yum! Looks delicious! I agree with the dinner party thought. These were simple, delicious,and so quick. Oh, what a great pic! You're right, they're so easy to make ... might be a good one to do along with company. Everyone always seems to gather in the kitchen. Yours turned out beautifully! Molten in the middle. Mine were a tad overbaked, but that did not slow us down! They'll definitely be my go to recipe, they were so easy to make and really chocolatey! Maybe I'll try them as gooey as yours next time, they look delicious! They look EXACTLY how a gooey chocolate cake should look! Welcome aboard! Well done on your first challenge too! Yours turned out lovely. Mine was more fudgy inside instead of molten, however it was still delicious. I think I will follow your lead and cut down on the baking time the next time I bake them! They look so tasty! ALl goeey, and not solid like mine. Ooh! Look at all the gooeyness! Yum! I'm with you... I can't think of a better antidote to a stress-filled Monday than an evening with a bit of music, perhaps a glass of wine, melted chocolate, and Dorie. Great job! I love the gooey look of your delicious cakes! WOW! Lots of Gooey molten delicious-ness! I agree that these would be a perfect dinner party dessert. I'm impressed at just how molten your cakes remained, mine were still quite gooey but definitely not lava-like. They look great! I should have read the comments on TWD like you before baking my batch of chocolate cakes last night. I didn't reap the benefits of procrastinating this time around, and it showed when I didn't get see any goo coming out of my cakes. Wonderful job; your cake looked scrumptious! The more I see these creations every Tuesday, the more I want to learn how to bake. That's a really nice molten lava inside in those cakes. Yours are so gooey!!! I will def reduce cooking time next go round. Great job! This looks so good! I think these are the most gooey cakes I've seen!